Sarah Alfarhan: Last 3 Illustration Academy assignments .. 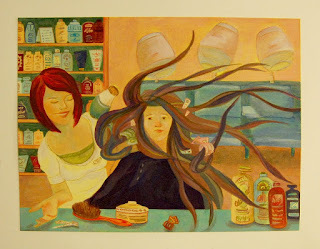 This was an illustration of a conversation taking place in a salon .. I've painted it with gouache on bright yellow poster paper .. you can still see the yellow coming through. It was a challenge & a real fun experiment. An illustration of a sound "POP" .. I painted a girl taking off barbies heads ! 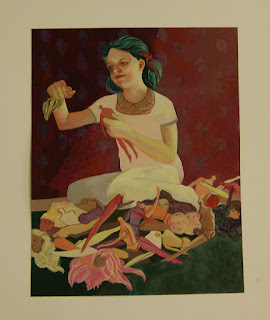 I painted this illustration with gouache on Tea green pastel paper. 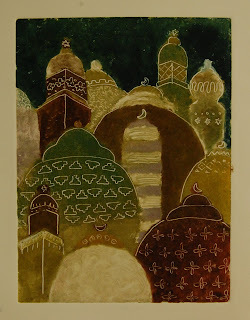 A monotype print for a traveling poster, destination: Morocco .. I've never done prints before so I decided to try it out since George Pratt brought his press to the studio. I am planning to experiment with printing techniques in the future. Please click on each image to better see each illustration. The smaller size doesn't faithfully represent the original colors.